Learn to Strip Like a Pro... Don't worry, it's not as risque as it sounds. 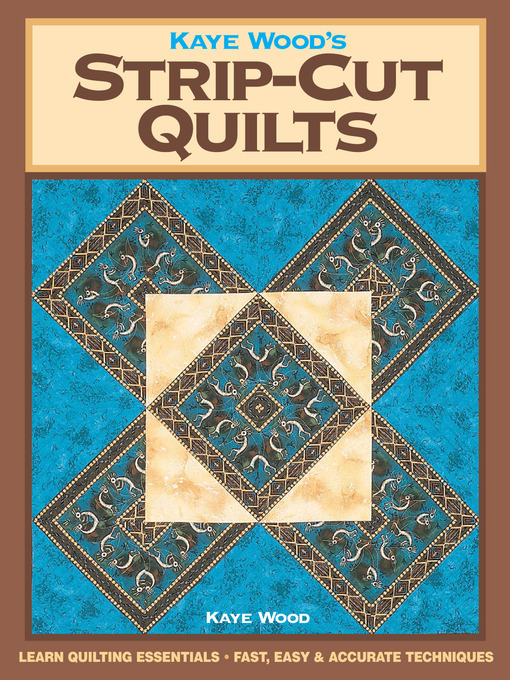 In this 96-page full-color book, renowned author and television personality Kaye Wood takes readers through the procedures necessary to master the art of strip-cut quilting, as part of her Strip Like a Pro program. With easy-to-follow step-by-step instructions for 30 different quilt projects and 23 quilt block techniques, quilters of all skill levels - from beginner to advanced - can enjoy the beauty of finished quilts that are neither too difficult nor time-consuming. More than 30 photos and dozens of illustrations let you see what grand projects await. "I love the teaching part of quilting," Wood says. "The incredible response of my students is a real high for me. Whatever their skill level, I can help them to enjoy making quilts. "some of my students go on to teach my techniques, and some go on to enter quilt shows. Their success becomes my success." Such success is made easier through Wood's self-designed Starmaker Master Templates and several quilting tools. Designs in this book rely on Starmaker 8 of which a paper version is included and details are provided on where to buy the acrylic template. So wait not one more minute. Tell you friends and family that you're learning to Strip Like a Pro, and surprise them later with the various seasonal and gift-giving ideas provided within!